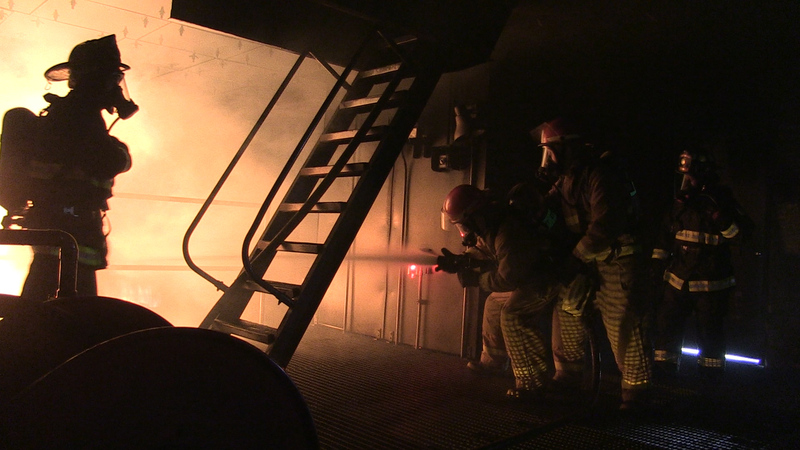 SAN DIEGO, CA — The flying Squad from the USS Boxer squad participated in a pilot program of the Shipboard Firefighting/Damage Control Emergency Team Trainer at the Surface Warfare Officer’s School Learning Site San Diego on March 30. SAN DIEGO (NNS) -- The crew of amphibious assault ship USS Boxer (LHD 4) successfully executed a light off assessment (LOA), Jan. 19, moving one step closer to going back to sea by demonstrating they are ready and able to safely operate the ship's engineering plant. SAN DIEGO (NNS) -- The multi-purpose amphibious assault ship USS Boxer (LHD 4) completed another combat readiness milestone by completing Anti-Terrorism and Force Protection (AT/FP) certification 1.3 with an overall score of 95.78 percent, Nov. 2. SAN DIEGO (NNS) -- Sailors aboard amphibious assault ship USS Boxer (LHD 4) passed the Fleet Support Operations-Medical (FSO-M) 1.3 assessment with an overall score of 96, Sept. 22. SAN DIEGO (NNS) -- Amphibious assault ship USS Boxer (LHD 4) won first place in the third-annual Naval Base San Diego (NBSD) Sexual Assault Prevention and Response (SAPR) Cup competition, April 21, at the NBSD Admiral Prout multi-purpose field.